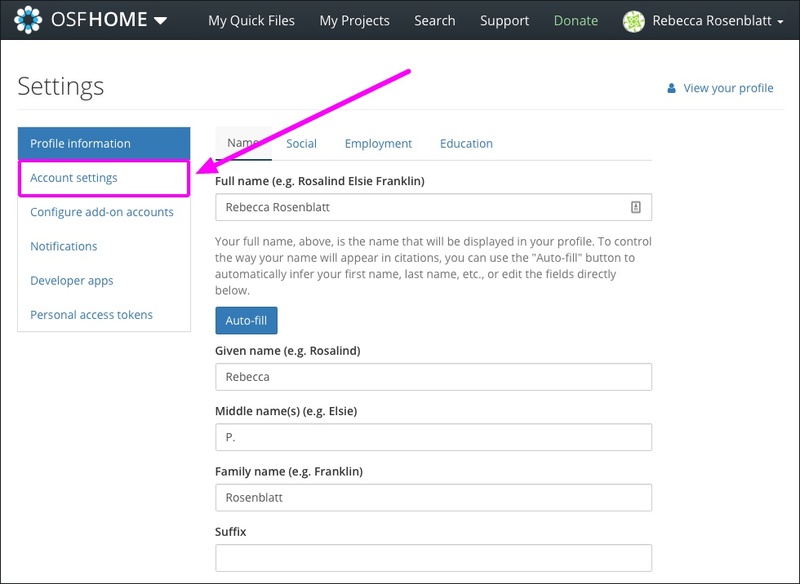 You can add alternate email addresses in addition to your primary one that you can use to log in to your OSF account. 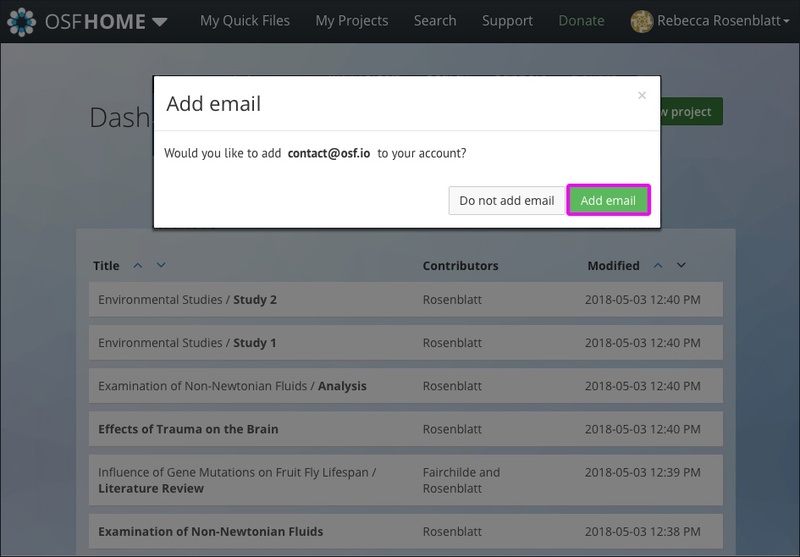 For example, if you use a university email address, you may add an alternate email address if you anticipate losing access to your university one. You will only receive notifications and other OSF emails at your primary email address. 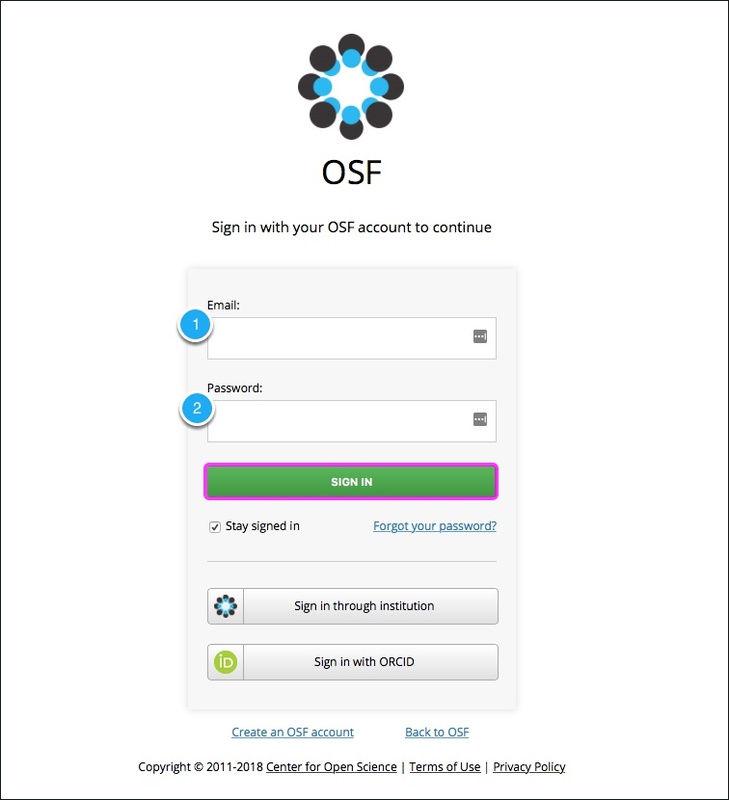 Alternate email addresses allow you to sign in to the OSF under different emails (but with the same password that is associated with your OSF account). 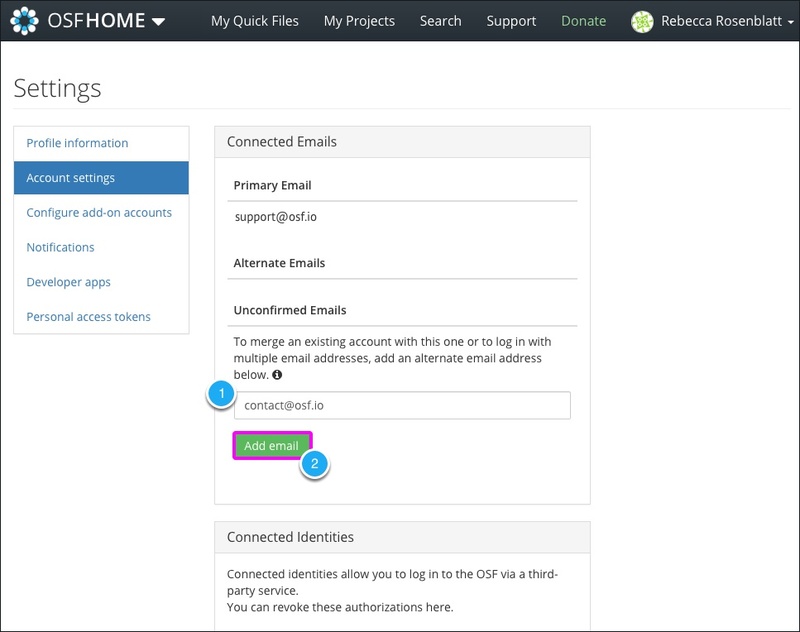 You can update any alternate email address to be your primary email. Click your name in the top right, then click Settings from the drop-down menu. Enter the email address that you want to add to your account into the text box below the "Unconfirmed Emails" section. Then click the Add email button. A confirmation modal will appear with instructions. Sign in to this email account, then click the link in the email to verify your email address. You will be taken to the OSF "Sign In" page. When you sign in to the OSF, enter your primary email address that is associated with your main OSF account (not the alternate email address that you're adding to your OSF account) and password. 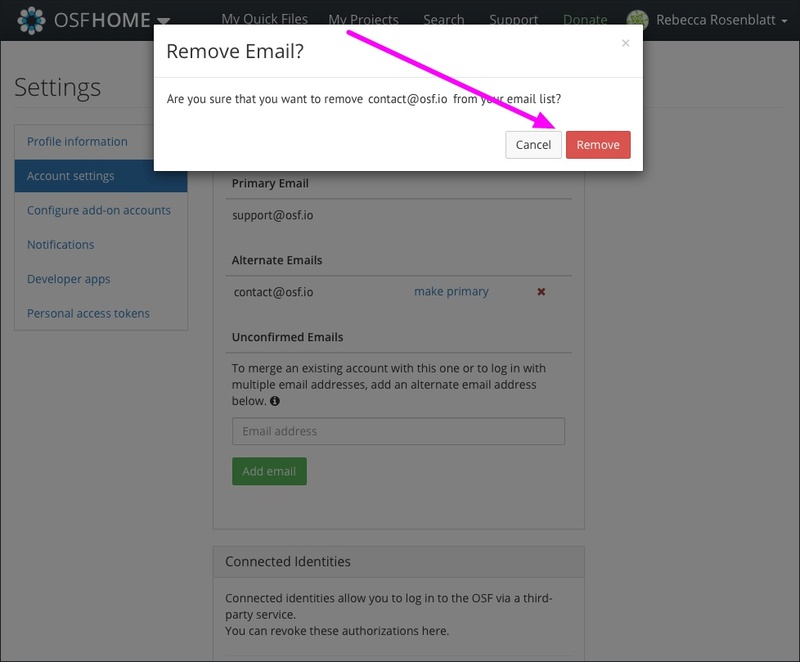 After you sign in to OSF, a modal will appear in which you will need to confirm that you want to add the alternate email address to your OSF account. Click the Add email button. 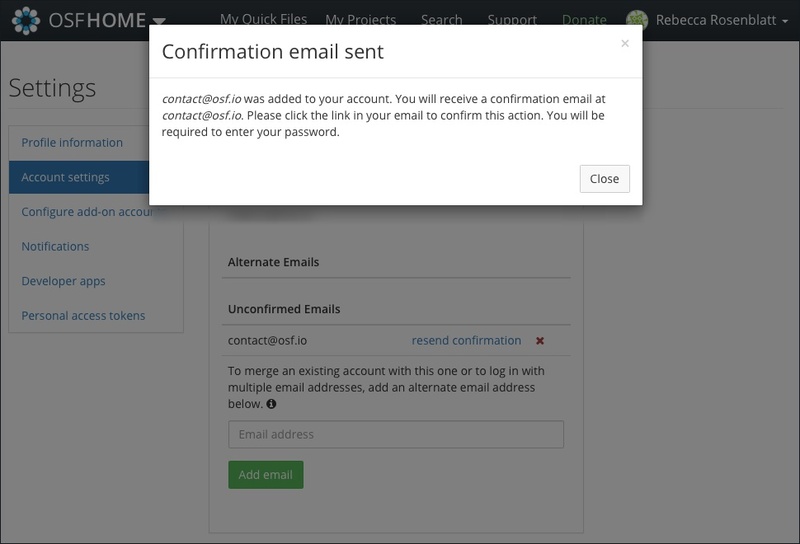 The modal will close and your alternate email address will be added to your account. To change your primary email address, you will first need to add an alternate email address to your OSF account. To make an alternate email address your primary email on your OSF account, navigate to your Account settings page. Then click the make primary link to the right of the alternate email address. The alternate email address will be made your primary email on your OSF account. You can still use either email address to sign in to the OSF. 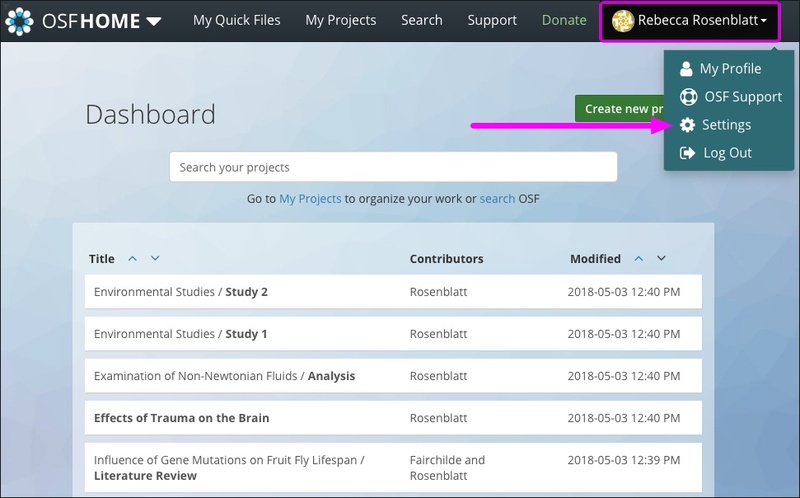 You will receive OSF emails and notifications at your new primary email address. Only alternate email addresses can be removed from your account - the primary email address cannot be removed. 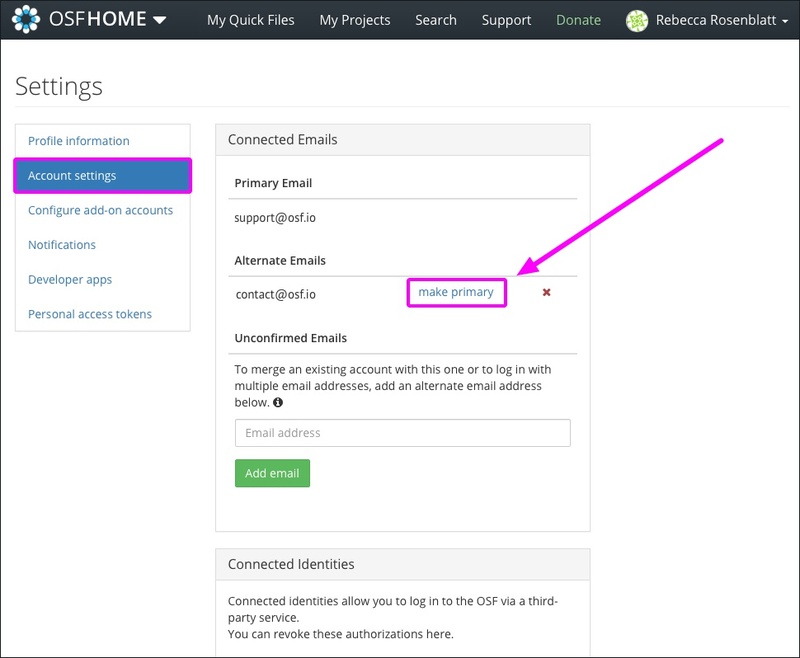 To remove an alternate email address from your OSF account, click the red x to the right of the "make primary" link. Click the red Remove button. The alternate email address will be removed from your OSF account.